This is something that many of you are requesting for a while: an auto-completion plugin for Sublime Text. It was tested on Sublime Text 2 and 3, I just released it so if you have any issue put a comment here or open an issue in github. 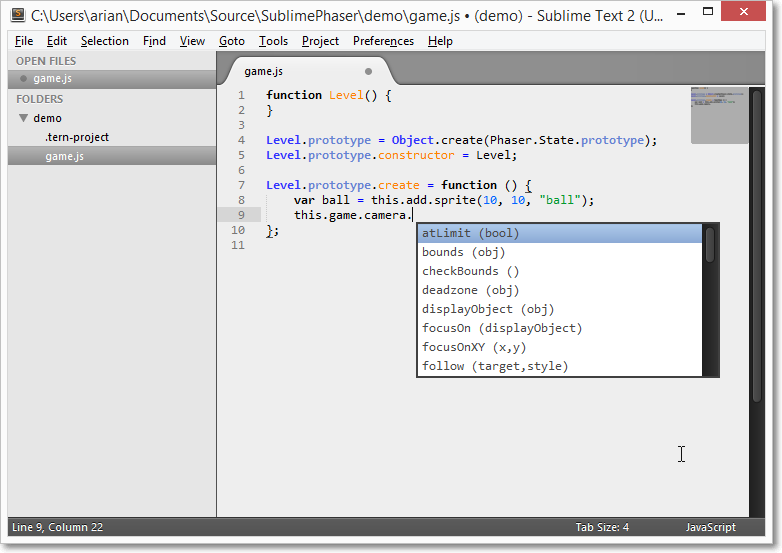 Remember Phaser Editor is a very nice complement to Sublime Text. I'll be trying this out today. Thanks! Hehe oh god! Git ignored the whole node_modules! 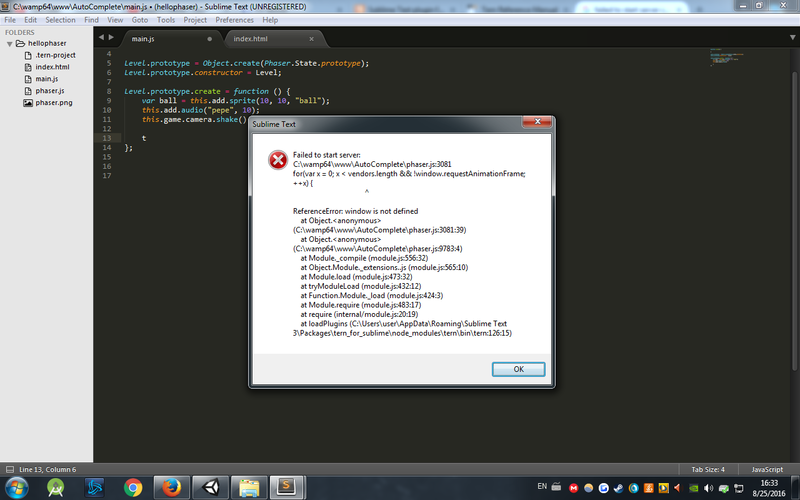 This error persists through restarting sublime. *** EDIT *** NINJA'D, I'll try it with the new push. Please wait a bit, as I said, I am pushing lot of code that was ignored by git. Done! I uploaded the missing files. Please update it and test again. Is there a way to get the autocomplete to indicate a bit more visibly which things are properties and which are methods? Right now a method looks like this: add (child,silent) and a property looks like: alive (bool). It would be cool if properties displayed more like alive:bool. It would be easier to tell at a glance what is what. 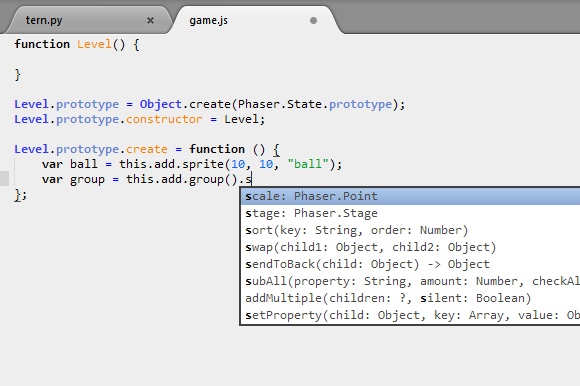 Also, while playing around, I noticed that Phaser.Group didn't have the scale property available in the autocomplete. How would I go in to add missing properties? I updated the Phaser definitions with the last changes from Rayo. And the completions now have a difference between properties and methods. Haha, this is great. Maybe it's finally time for me to move away from Notepad++ NOW! This is a perfectly valid reason eh?! Also, how did you get a light skin on sublime? I always hated the dark skin one, which was why I never really made the switch. I like the clear / white notepad ++ feel. Hello, this is a great plugin , I would like to use it. But I'm having some problem. My basic project template is that I make 1 my game object like CTB. Then I make other objects like "Boot", "Preload", "Menu", "Game", "Ending" etc from the CTB object. And different preload, create, update inside those objects.I also put "Boot", "Preload", "Menu", "Game", "Ending" etc in different files and put them together in the index.html file. Here is an example of my object creation. the problem is that when I try to use the code hinting inside any of the preload, create, update function I don't get any.hinting. Is there anyway for me to solve this? thanks in advance if you reach this far =). @minhaz1217 The problem is that in the first case it is not working to you, the inference engine has no way to know that you are creating a "sub-class". You are cloning the ternjs repo, not the PhaserSublimePackage repo. "Failed to start server C:/wamp64/www/MyTestProject/phaser.js:3081... "
If I get rid of the phaser.js file it is working, but then I cannot start my project, it shows a blank page. Any idea how to fix that ? The package uses ternjs so your `.tern-project` file is your best friend. It seems that keeps looking into phaser.js. I just can recommend to start a new project and do it again. Well... I don't know what could be the problem. The only thing I can do for you is to test your project here in my machine. Yes, I was able to reproduce the error. The "dontLoad" is not working, please can you open an issue in github? As work around you can rename `phaser.js` to `phaser.min.js` it worked for me. Thanks man, it also works for me !! I opened an issue in github. So what is the difference between phaser.js and phaser.min.js ? It seems that ternjs ignores *.min.js files by default. Thanks for opening the issue.